(Johns Hopkins, 2009) xiv + 349 pp. Reviewed by Mary A. Favret on 2009-09-01. Women poets have not lately been slighted by specialists in British Romanticism. Just over two decades ago, in his landmark essay titled "Romantic Poetry: The I Altered" (1988) Stuart Curran advocated a new investigation of poetry by women in the Romantic period, challenging critics to set aside long-held assumptions and distortions. 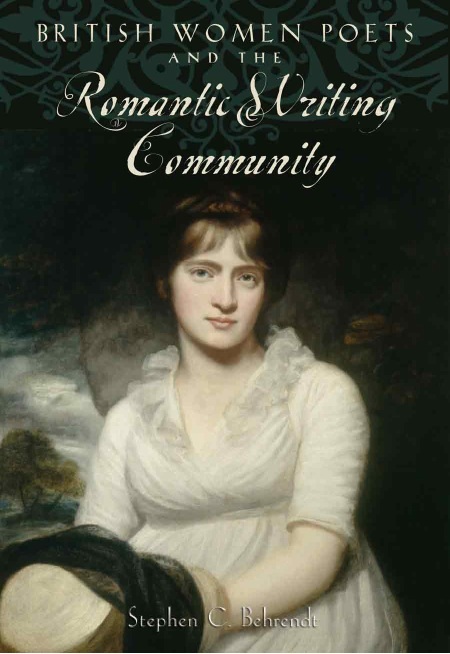 A year later, in The Contours of Masculine Desire: Romanticism and the Rise of Women's Poetry (1989), Marlon Ross placed the work of poets such as Anna Letitia Barbauld and Mary Robinson in serious conversation with the canonical male poets. Anne Mellor, who had included Curran's essay in her influential collection, Romanticism and Feminism (1988), offered her own re-mapping of the field of Romantic studies in Romanticism and Gender (1993) five years later. Donna Landry's The Muses of Resistance: Laboring-Class Women's Poetry in Britain, 1739-1796 (1990) helped broaden the initiative to the working-class, including the former slave, Phyllis Wheatley. Dozens of articles and dissertations responded to the growing collection of work, demanding a revaluation of poetry of the late eighteenth and early nineteenth century, a period in Britain when, as J. R. de J. Jackson's bibliographical work has demonstrated, hundreds of women published poetry and several sold more and were more widely read than their male contemporaries. With the arrival in the mid-nineties of Paula Feldman and Teresa Kelly's Romantic Women Writers: Voices and Counter-Voices (1995), Jerome McGann's The Poetics of Sensibility: A Revolution in Literary Style (1998), and Feldman's indispensable British Women Poets of the Romantic Era: An Anthology (1997); and with the subsequent availability of excellent editions of poetry by Barbauld, Robinson, Felicia Hemans, and Charlotte Smith, one would think that by the turn of the twenty-first century, women poets had been fully integrated into the study and teaching of British Romantic Literature. In their attention to women poets in particular, romanticists have stepped slightly ahead of scholars in neighboring fields, such as Eighteenth-Century and Victorian Studies. This point is confirmed by recent editions of the Norton Anthology, the Longman anthology, and other major anthologies of Romantic literature, though they offer "only a piecemeal sampling" of the writing of the age (xi). Why then does Stephen Behrendt insist that "the present moment" requires "a wholesale reassessment" of British Romanticism, especially along the lines of gender? What allows him to argue that despite two decades of scholarship directed at recovering women's writing (scholarship which Behrendt has read scrupulously), students of the period have not fully faced the "historical reality" that 'the Romantic literary community was more diverse and more dynamic than could be intuited from the six poet model of British Romanticism with which generations grew up" (2)? Whether or not the current generation actually subscribes to such a model remains outside the ambitions of Behrendt's study - but barely. What seems to motivate this book and unsettle even its own familiar arguments about gender bias are the new modes of research and reading occasioned by digital media, especially the large, searchable databases of early published material: e.g. the Eighteenth Century Catalog Online, the Chadwyck-Healey database of English Poetry, and the Brown Women Writer's Project. Behrendt himself has been closely involved with several such databases: editing a valuable online collection of Irish Women Poets, advising the UC Davis online project British Women Romantic Poets, 1789-1832, and participating in digital projects related to the Corvey collection of Romantic-era literature, including the Corvey Women Writers on the Web (CW3). As countless poems and poets rather suddenly become available to everyday students of Romanticism, long-held methods of categorizing and generalizing lose their efficacy and fade. As Behrendt observes, "a largely anarchic literary marketplace" prevailed in this period, when poets from all walks of life managed to produce ten thousand published volumes of poetry, and when the regulatory notion of the "literary" had not yet stabilized (14-15). How to respond to this newly visible "anarchy" becomes a compelling intellectual question for scholars of this critical present. Building primarily on feminist scholarship of the last twenty years, Behrendt has learned that the standards of value which resulted in the canonization of a small group of male poets have suffered serious attack. He has learned, as many other romanticists have, to appreciate the aesthetics of sensibility, to discern the subtle and effective politics of sentiment and sympathy at play in the work of many women poets. He can detect the ingeniously performative, as when he reads through and past the self-deprecations marshaled by many women writers. Indeed, his book functions as a useful compendium of most of the major feminist research on women writers, especially women poets, with strong - and fully acknowledged --debts to Curran, Mellor, Feldman, Paula Backscheider and Susan Wolfson, among others. To this research Behrendt wants to add two new strategies. First and foremost, he wants to push past questions of aesthetic value and significance in order to highlight the sheer number of women writing poetry. Repeatedly, he asks us to read texts by women who were hardly known or rarely read, insisting that they too have something to tell us about a more "diverse and dynamic" Romanticism. Second, as his title advertises, Behrendt considers his poets as writing in or at least seeking membership in "an active - even an interactive -- community of writers and readers," where "community" signals something other than the abstraction of a "public sphere." Taking his cue from the poet L.E.L., Behrendt sees community both as the forging of sympathetic bonds and as a shared "consuming of art" not easily distinguished from the "communion" that names a sacrament and marks a religious community (4, 5). As anyone who has read their poetry extensively can testify, Romantic women poets routinely invoke, quote and recycle each other's work, and often express their yearning for a sympathetic audience. But then this does not much distinguish their poetry from that of their male colleagues; the difference is perhaps a matter of what Behrendt calls "shading" (36). In advancing these two critical strategies, Behrendt risks methodological and practical difficulties. How can you argue for unfettered inclusiveness on the one hand while at the same time attending to the construction of self-conscious community? Why, for instance, limit the "writing community" to poets and not novelists, essayists or playwrights (indeed, several of the women in the study wrote in a number of genres)? The competing impulses thus revive that bogey-question: what then is Romanticism, let alone the Romantic writing community? What does the term include and exclude? To which Behrendt responds with an historical rather than intellectual rationale (for him British Romanticism extends from the years 1780-1838, in part to allow for the inclusion of specific women poets) -- and with a dodge. He rejects the concept of Romanticism as the product of academic "simplification" and "expediency" (33, 5). Today, he writes, "it becomes hard any longer to tolerate -much less to justify - monolithic terms like "Romantic literature," "Romantic poetry" or even "Romanticism"; "the definite article 'the' [before the word Romantic] implies a monolithic construct that implicitly resists and excludes consideration of alterity . . . and of diversity" (3, 30). And yet. His title refers to "the Romantic Writing Community" rather than to a less definitive but more clumsy "late-eighteenth and early nineteenth-century writing communities." Now as then, the "democracy of the literary marketplace" (15) likes its familiar categories, and a book-length manuscript in that marketplace must submit at some point to simplification and expediency. "Even in an extended study," Behrendt admits, ". . . there is not space to consider everything by everyone"; the author must be "selective rather than exhaustive" (36). In a way, then, each of Behrendt's chapters could perhaps be expended into a book-length study. They are "preliminary" openings, invitations to further research along various paths. Two are organized thematically (women poets on radical politics, women poets on war); two by formal considerations (women writing sonnets, or experimenting with genre) and two by national identification (Scottish and Irish women poets). Presumably, these diverse routes offer different approaches to that sought-after ideal of a "community of writers." In each chapter, Behrendt introduces poetry by women that is both familiar and unfamiliar. Sometimes he persuades us that the poetry is compelling, sometimes that it is curious and deserves more attention, and sometimes that it simply exemplifies a certain rhetorical device, mode of critique, or appeal. To this reader, the material on Irish and Scottish women poets was most valuable. Situating a well-known poet like Joanna Baillie ("an expatriate Scot") in the company of and yet apart from her countrywomen was especially illuminating, as Behrendt recalls the "double disadvantage" under which Scotswomen (and Irishwomen) wrote during a time of cresting British nationalism (214). The "internationalism" he finds in Baillie's work is convincing, and deliberately complicates the very lines of "community," imagined or otherwise, which hold together British Women Poets. To my mind the work performed here is helpful, if occasionally predictable, and does invite the reader to investigate the work of lesser known poets. But an opportunity has been lost, for in fact the major paradigms we use to read Romantic poetry remain fairly firmly in place. The modes of interpretation that Behrendt employs - thematic, formal and rhetorical, and always carefully informed by socio-political history - do not in the end address the opening questions posed by his study: what to do with the now visible "anarchy" of the literary (if not scholarly) marketplace, as well as what to do with the thousands of volumes of poetic writing (not to mention other forms) increasingly available through digital resources? If we aim at inclusivity and turn away from hierarchies of value, how can we also be "selective"? The same questions would apply if the book took for its subject unknown or forgotten male poets. Or playwrights or journalists, rather than poets. Or indeed, novelists. Franco Moretti has for years now been asking his fellow scholars of the novel to face the fact that there are too many novels to be read by any individual. Any claims we make about the genre that are based on the novels we do read are necessarily partial, exclusive and probably wrong. Moretti has advocated a different approach to the study of the novel, based more on statistics and collaborative reporting and less on individual and close reading. "Distant reading" is one name for this alternative. Behrendt's commitment to his neglected trove inspires admiration: someone in the twenty-first century has cast his eyes upon nearly all of these poems otherwise left unviewed, in most cases, for two hundred years. Such ambition and commitment are daunting, but perhaps also misguided: is this a task for an individual or for a (scholarly) community? If "Romanticism" as a category now seems too value-laden and exclusive, and if poetry matters most as an index of diversity and dynamism, should the poetry of the period - canonized or forgotten, by men or women, from one class or ethnic group or another-then submit to 'distant reading" and will the mainframe server form the final guarantee of community? Mary A. Favret is Associate Professor of English at Indiana University-Bloomington. Leave a comment on Mary A. Favret's review.